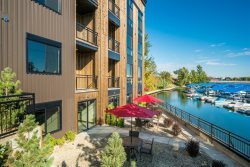 Located only steps form the marina and public beach, these comfortable, well-appointed craftsman style residences are waterfront living at its best. These units feature fully equipped kitchens, spacious living areas, & modern amenities. Close to restaurant, market, & fitness center with outdoor pool and spa. Guests are steps away from parks, beaches, and miles of hiking and biking trails.